Shoeshine is one of those films that DVD was made for, but, amazingly, the Eureka release is the first true issue of a film universally considered a landmark of European cinema. The only previous releases were both American: a swiftly-withdrawn Image Entertainment DVD and an earlier (and rarer) New York Film Annex video, the unavailability of which caused Shoeshine to form a legendary reputation as one of those tantalising films that one had heard of but could not obtain. Fortunately, the Eureka release does not merely offer a quick snack of relief to those eager souls keen to indulge but offers them a vast buffet of sumptuously exotic sweetmeats guaranteed to appease their most ardent filmic desire. The context of Shoeshine is inextricably bound to Neorealism- a spontaneous style of filmmaking popularised in Italy whose Cinecitta studios had been largely destroyed as World War Two intensified. Forced out into the streets, and taking their inspiration from contemporary events and people, were a new breed of cinema artists- Roberto Rossellini, Luchino Visconti, Cesare Zavattini and Vittorio De Sica among them. These directors utilised a new kind of ‘life-as-it-is’ realism and combined this with highly affecting powerful stories of great humanity and power. Thus, the 1940s marked a golden era of Italian cinema, one for which it will always be remembered. Shoeshine opens with a great sense of exhilaration as boys, as yet undefined or named, gallop through the countryside on horses. Subsequently, we learn that they are not rich enough to own the horses they ride but are merely experiencing brief moments of freedom before returning to the harsh realities of war-time Italy. Our two leading characters, Pasquale and Giuseppe, have an affinity to one particular horse- Bersagliere, and wish to buy him outright. Here, an immediate problem is posed for our young protagonists- they need to find money they do not have in order to possess what they truly desire. Returning to shine the shoes of the American G.I.s (hence the film’s title), the boys’ speech and behaviour soon reveals the true state of their daily lives. Giuseppe comments that his parents will not care about him and his friend Pasquale says that ‘money has no value nowadays’. These are boys who are neglected by their elders and hardened by the commercial nature of wartime society- indeed, Pasquale’s parents are subsequently revealed to both be dead- he is forced out on his own. The life that both boys lead is one that forces children to become premature adults and circumvent the law in order to survive. It is this that leads them to accept stolen American blankets to try to sell to the fortune-teller which precipitates her denunciation of them for alleged monetary theft. It is the unfounded nature of this allegation that links to the air of injustice that permeates the whole of the film which refuses a Hollywood-esque sense of fairness and re-established equilibrium. Thus, if Shoeshine had been made in America, it would probably have ended up with the boys being rescued from a life of delinquency and adopted into a surrogate, loving family. Shoeshine does not utilise such a solution, however, and paints a grimly authentic portrait of wartime Italy devoid of the niceties of a happy ending. This basis in harsh reality is fed through a highly marked visual style that also signifies Neorealism- in this case, after the fortune-teller denounces the boys in a sequence dominated by ominous music and dark shadows and they are taken away in the police van, the mise-en-scene and framing shows their entrapment. The boys reside on the left hand side of the frame, separated by bars from the carefree youngsters playing in the street (right of frame) who are also brightly lit as if theirs is a different world of equality and fairness. Then, the two boys move toward the front of the van (and also us the audience) but bars separate them from the front (and therefore from us). The camera then cuts to a point-of-view shot of the bars, now in the foreground, through which can be seen the prison. The composition of these shots suggests the boys are trapped, not merely in the police van but in a wider society- an adult one devoid of justice or compassion. The result of this sequence of shots is a terrific empathy for the pair, heightened by the tone of the music which indicates prison will be a trying and chastening experience. Perhaps the overriding sense throughout Shoeshine is the state of the country as exemplified in the prison which is overcrowded with young boys and its staff who seem (with one exception) to lack any sense of feeling for the sheer waste and injustice inherent in such a situation. The one exception to the corrupt officials is Bartoli, whose narrative task it is to highlight the plight of those in the cells- ‘these boys have been in jail for months’ he states sadly, adding later ‘these are only boys’. Thus, a sense of contrast is established between the adults and the children, an ironic gulf of social equality as the latter are encouraged to become the former in order to prosper yet when they do they are imprisoned whilst the authority’s seemingly endless ‘investigations’ take place. This contrast is evident in the next scene as the boys’ food is sampled by an official and deemed ‘not bad’ and ‘passable’ whilst other adults eat loin steak and hesitate to choose from a fine menu. De Sica includes such moments to heighten the contrasts between what’s fair and what isn’t, the contrast strengthened by the way the boys are treated (Pasquale is separated from Giuseppe and placed in a different cell, the pettiness of the officials evident as they prevent Giuseppe from giving his friend some of his food parcel from home). The purpose of the pair being imprisoned is, of course, to draw from them the truth regarding unlawful behaviour and the names of those involved. The sequence where this is actually done recalls the savage treatment of Manfredi in another Neorealist classic, Roberto Rossellini’s Rome, Open City (1945), as Giuseppe is taken from Pasquale’s view and, as far as Pasquale knows, viciously beaten. In reality, and in a technique resembling cinema itself, Pasquale is only shown a part of the whole- he logically infers that the Chief is hurting Giuseppe even though we know the boy is elsewhere. As Pasquale betrays Attilio (Giuseppe’s brother), the soundtrack becomes mournful, symbolising as much as anything the change in the boys’ relationship that the betrayal will create- things will never be the same again. Even though the narrative drive (a hierarchy of knowledge and unavoidable betrayal, ironically through a sense of extreme loyalty), has been firmly established, De Sica is not afraid to offer little vignettes of life in prison to show the base injustice of life in wartime Italy, particularly for the young. An example of this is the boy whose mother cannot see him, so sends a stranger. The cinematography and mise-en-scene combine to show the expectation shattered- the boy’s hopes are dealt such a blow that his eyes well up with tears in a truly affecting moment. Such vignettes are dotted throughout Shoeshine’s structure, and combine with great effect to the overall impact of the film. Throughout the majority of Shoeshine there is also an over-riding sadness: following Pasquale’s enforced betrayal of Attilio, Giuseppe fights his former friend in the courtyard then in turn causes Pasquale to suffer by becoming an accessory in an underhand plot to plant a file in Pasquale’s cell. This time, however, the beating is real- Pasquale is hurt, and Giuseppe cries for it to be stopped. The violence of the beating is to be seen in the marks on Pasquale’s back in the scene in the showers yet the friendship between the two boys is resurrected as Giuseppe supports his old friend (Pasquale) against his new friend (Arcangeli) as the two fight. The result of this brawl is isolation for Pasquale, and a downturn in the fortunes of both boys. De Sica’s film moves on from bad to worse, from prison to court. The connotation of a law court is one of justice but this fails to transpire. Instead, despite the lawyer’s reference to ‘children who are all alone’ there are fines and imprisonment for Giuseppe, Pasquale and Attilio. Thus, the incarceration in prison, once of an uncertain duration, is made firm- and it prompts the boys’ attempted escape, ironically during a cinema showing that includes a newsreel entitled News From The Free World. This sequence is extraordinary for it presents, on the one hand, a sheer desperation (in the escape) yet, on the other, a heart-rending sadness (a boy called Raffaele is trampled in the chaos and later dies). The mid-evening escape features stunning cinematography as the day draws to its close with the escapees still on the run- it is in many cases a flight for their very lives. Pasquale’s own escape plan becomes a result of Giuseppe and Arcangeli’s burst for freedom, but he is armed- they are not. Ultimately, midst an idyllic pastoral setting on a bridge in the country, far away from familiar surroundings, Pasquale strikes Giuseppe who falls from the bridge, hitting his head on the rocks below. Then, as Pasquale cries in heartfelt anguish for his friend watched by the motionless authorities, Bersagliere slowly trots off. This ending, as unexpected and relentless as it is, does not attempt to offer a solution to the downtrodden nature of wartime Italy, nor a comforting solution to the problems of youth. Instead, it presents a possible reality- a believably logical sequence of events to highlight what could (and did) go on. Of course, the irony is that the horse leaves the boys- its slow trot into the night contrasting sharply with the opening of the film which is filled with light and gaity, expectation and excitement. The print quality of Shoeshine is excellent and sharp, whilst the extras add significantly to the overall experience. These include a very accessible, user-friendly commentary from Professor Bert Cardullo and a superb 24 page illustrated booklet which includes reviews by James Agee (1947), Pauline Kael (1961) and comments made by De Sica himself back in 1955. In summation, the DVD is a model of committed dedication- Shoeshine has finally received the treatment it deserves which enables everyone to discover its many charms and its incandescent beauty. 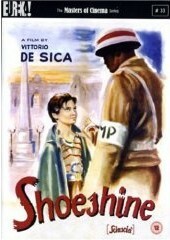 Shoeshine is available on DVD from Eureka as part of their ‘Masters of Cinema’ series.